Largehearted Boy: Book Notes - Chrissy Kolaya "Charmed Particles"
Book Notes - Chrissy Kolaya "Charmed Particles"
Chrissy Kolaya's novel Charmed Particles is a brilliant debut peopled with skillfully drawn and unforgettable characters. "Writing with bright tenderness, piquant humor, and supple wisdom, Kolaya emulates, ever so subtly, the fleet dynamics of particle physics as she orchestrates a mesmerizing plot of revelation and adaptation." 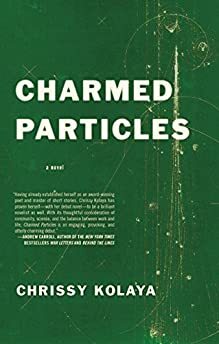 "Charmed Particles is about high-energy particle physics, gentlemen explorers, gifted and talented teenage girls, Mary Kay ladies, and one South Asian woman's assimilation to 1980s suburban Chicago, with a special focus on her fascination with American novelty convenience foods." I hope you'll keep reading on the off chance that's the sort of thing you've been hoping someone would write a book about. "Rural Nicolet, Illinois, is a city anchored between two opposing forces, a living history museum devoted to the American frontier and a laboratory for experiments in high-energy particle physics. When the proposal to build the Superconducting Super Collider under the town sparks debate between the scientists and the locals, two families find themselves on opposite sides of controversy that fractures the community, exposing deep cultural rifts between longtime friends. Abhijat, a scientist from India now working at the National Accelerator Research Laboratory, has a sole obsession: making a name for himself as one of history's great theoretical physicists. The search for recognition blinds him to the burgeoning distance between him and his wife, Sarala, who devotes herself to their daughter Meena and assimilating into suburban America. Across town, Rose Winchester strives to raise precocious Lily, stitching together an unconventional marriage from the brief visits and vibrant letters of her husband Randolph, who fancies himself the last great gentleman explorer. With incisive prose and infinite humanity, Charmed Particles traces the collision of past and progress, science and tradition, and the unimagined elements that may arise in the aftermath." Meena and Lily are two young girls whose friendship is the reason the book's two families, the Mitals and the Winchesters, know each other. Both girls are baby geniuses—gifted and talented students, yet each responds to her classmates and to the world in very different ways. Meena and Lily would, of course, be huge TMBG fans (as all good nerds are), and this song in particular speaks also to Meena's father's work as a theoretical particle physicist at the National Accelerator Research Lab. My friend Mark Janka, the man behind Spare Machine, is an incredible songwriter—his lyrics are like the most beautiful poems. This is one of his—different and better, I think, than the Moody Blues song of the same title. Lily's father, Randolph, is a kind of man-out-of-his-time, a Victorian-era gentleman explorer type (not unlike Dr. Livingston) inhabiting the world of late 20th Century adventure travel and the American Midwest. His often-incongruous presence in 1980s suburban Chicago was for me, one of the most enjoyable and weird parts of writing this book. This is a great song about life in the kind of suburb where the characters in Charmed Particles live. Sarala (Meena's mother) moves from Bombay to Nicolet in 1972 with her new husband, and settles into their life in the Chicago suburbs. Sarala's a tough cookie and a good sport who throws herself into learning about her new home. For Sarala, this takes the form of an enthusiasm for the convenience foods of her adopted country, self-improvement and motivational literature, and the local living history facility, Heritage Village. Abhijat (Meena's father) and Rose (Lily's mother) wouldn't know this song (though their daughters certainly would), but it's a great theme song for their individual struggles and ambitions: Rose wants to be elected mayor of Nicolet, and Abhijat hopes to be remembered as one of history's great theoretical particle physicists. The issue of the Superconducting Super Collider (a scientific tool Abhijat's lab hopes to construct beneath the town) becomes a powerful force acting upon both Abhijat's and Rose's aspirations. The Superconducting Super Collider (SSC) was a real project under consideration at a number of locations around the United States in the late 1980s. The story of the SSC is fascinating, and you can learn more about it here. In the midst of their town's conflict over the Superconducting Super Collider, Lily and Meena are in that unnerving position many of us experience as teenagers, in which we begin to see, often for the first time, that adults can be both fallible and selfish. Lily is frustrated at so often being told by adults that the way she sees the world is too black and white, that it doesn't leave room for grey areas. She feels like this is just "the thing adults tell kids when they don't want to admit that they're selling out." Although Lily and Meena's childhoods can best be described as unconventional (they spend most weekends in the Nicolet Public Library's reading room, and weekdays in the "Free Learning Zone," their school's gifted and talented program), once they hit high school, nudged along by Meena, the girls try their hands at some of the more conventional teenage activities—football games, dances in the cafeteria, etc. Meena takes to these events and enjoys them, but not Lily. Here's a mini playlist for the kind of high school dance the girls attend. Standing against the wall, arms crossed in front of her, Lily would have nothing good to say about this soundtrack. Her own musical tastes leaning more toward Siouxsie and the Banshees, The Pogues, and The Violent Femmes, Lily does not truck such musical nonsense. She would very much take the later revelations about Milli Vanilli to be evidence of the legitimacy of her repugnance for this sort of music. What good feeling-like-they-don't-fit-in kid in the 1980s didn't love the Cure? For me, this song conjures suburban Chicago, the world of the fictional town of Nicolet, a place anchored between two opposing forces—on one side of the town, a living history museum devoted to the American frontier and on the other, a laboratory for experiments in high-energy particle physics. Eagle's Crest, the neighborhood where both the Mitals and the Winchesters live, sits right in the middle: "on one side, the Lab, where scientists crashed subatomic particles into each other hoping to reveal the tiniest building blocks of the universe; on the other, Heritage Village, where costumed reenactors bent low over kettles, settling day after day this new country—the neighborhood itself like a literal threshold in time, holding apart the past and the future." In addition to her love of convenience foods and motivational literature, Sarala also has a healthy appreciation for American television, especially shows her husband thinks of as always "about rich and impossibly good-looking American families." In the evenings, Sarala retires to her and Abhijat's bedroom to watch her favorite programs. Abhijat, working in his study downstairs, hears these as he works, and these shows color Sarala's experience of her new home. Evocative of Randolph and Rose's early years—that sense of taking off together for a grand adventure, I imagine this beautiful song as a kind of soundtrack to their elopement and, years later, as background music with which Rose, in her suburban home, revisits those memories and rereads her and Randolph's letters. If you like this, you might also check out The Lesser Birds' "I Envy the Photons," an ode to one of the elementary particles. This would resonate, I imagine, with the Nicolet residents who oppose the SSC. These folks are worried about having the SSC built under their homes, about things like groundwater contamination, radiation, and real estate values. The difficulty the opponents of the SSC and the scientists in favor of it have in communicating with one another is one of the things I wanted to explore in this book: how do we successfully communicate in a responsible and accurate way about complicated scientific ideas? Released right at the time of the conflict over the SSC, this song channels that sense of aggression and frustration you experience while waiting for news of something—of both wanting the news and dreading its arrival. The whole town of Nicolet experiences this as they wait for the Department of Energy's decision on the SSC. Rose and Lily experience this as they wait for news of Randolph near the end of the book. The book's National Accelerator Research Lab is loosely based on Fermilab, where I conducted research for the book. I didn't realize until after I finished writing that my friend Lauren had spent her childhood summers living in family housing on the Fermilab campus, while her father, a theoretical physicist, conducted research. Lauren remembers listening to this song during that time. The story of Fermilab's family housing facilities (many of which are homes that were once owned by residents of Weston, Illinois, a town that no longer exists) is intriguing. If you're interested, you can read more about it here, here, and here. Not my favorite Radiohead song, but I felt like I couldn't leave this one out. Thanks so much for having me, David! I've been reading Largehearted Boy for years and always dreamed of someday getting to do this! Thanks so much for making that dream come true!